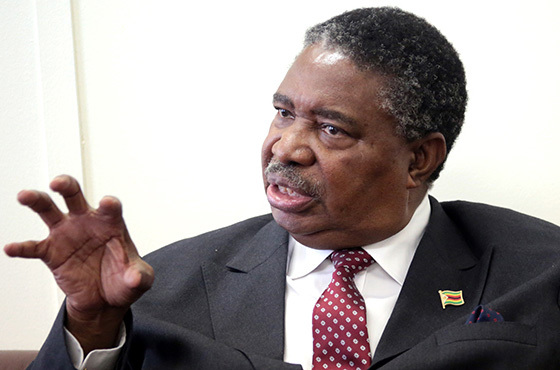 President Robert Mugabe must sort out the mess he has created in the country before handing over power to a successor, Vice-President Phelekezela Mphoko said in a subtle message to Zanu PF supporters in Bulawayo at the weekend. Mphoko told a Zanu PF inter-district meeting that Mugabe should be mature enough to understand that he was as much of a solution as he was the problem. “The President (Mugabe) should be part of the solution to problems going on in the country with regards to who will succeed him. He should do it well and quietly through the structures. He knows how to do it, he is mature and will do it well,” Mphoko said. Zimbabwe has literally come to an economic standstill as Zanu PF leaders engage in a brutal power scrap over the 93-year-old’s successor. The Zanu PF leader is battling old age and illness which he continues to deny, despite unending trips to the Far East that his handlers claim are for a recurring eye problem. While the succession issue has been taboo in Zanu PF over the years, with many having lost their political lives after broaching it, First Lady Grace Mugabe set the cat among the pigeons two weeks ago after she demanded that her ailing husband anoints a successor. Grace said she had been battling with Mugabe over the issue and wanted the public to know. “There is no need to hide your (Mugabe) horse (preferred successor) anymore, name your successor and we will support him,” Grace said. Vice-President Emmerson Mnangagwa, with support from sections of the security establishment, war veterans and a faction known as Team Lacoste, has been touted as a frontrunner. On the other hand, Grace and other Young Turks have coalesced around a group known as G40 that has of late begun to push for the anointment of Defence minister Sydney Sekeramayi. As if to indicate his hidden ambition, Mphoko threw in part of the agreement Mugabe had with late Vice-President Joshua Nkomo in 1987. “We agreed way back that Zanu PF and PF Zapu should not swallow each other. We said when Zapu is in leadership a person from Zanu PF should deputise him or her and vice versa,” Mphoko, known for his off-hand speeches, said. But the opposition Zapu led by former Home Affairs minister Dumiso Dabengwa immediately responded, accusing Mphoko of a sinister plot to hide his ambitions to succeed Mugabe behind its name. “The problem with Mphoko is that he has been out of the country for longer periods than he has been around. He has a lot of things he does not know, one of which is that Zapu left Zanu and anyone who remained in that party did so in an individual capacity. Zapu held a congress in 2009 wherein a resolution to walk out of the Unity Accord was reached,” Dabengwa said. Mugabe and Nkomo inked an agreement after years of acrimony that was epitomised by the Gukurahundi atrocities that left more than 20,000 civilians dead as the Zanu PF leader sought to impose his ideal of a one-party State.